Recently the chance came up to review PianoWithWillie by JazzEdge, and since piano is one of my passions that I rarely have time for anymore, I took this opportunity in the hopes it would help me find the time to play again. For the purpose of the review I was given the Studio Access level of PianoWithWillie. While this particular program is not recommended for young children without prior piano experience, both Amber and I are great candidates for the class. Amber is thirteen and has taken six years of piano, but her current instrument of choice is the flute. Even though I have not taken formal piano lessons in 25 years, I am an accomplished classical pianist. However, our levels of experience is not needed for the online course. I think an absolute beginner of at least age 10 would have great success. What is PianoWithWillie and how does it work? 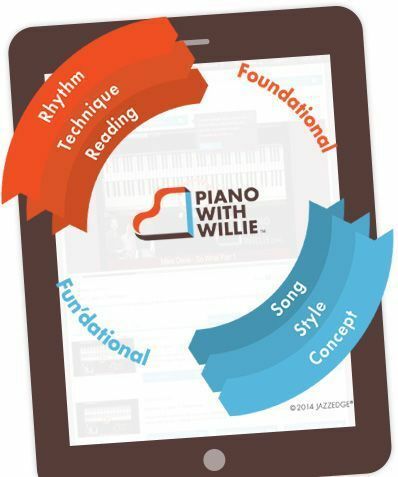 PianoWithWillie is a online piano program that provides lessons at a varying range of abilities and styles. Once signed in you begin at your Dashboard each time. Right away on the Dashboard is the Piano Start plan that helps a novice begin with lessons in the PianoWithWillie system. The Piano Start helps you understand their system and how to navigate, as well as getting you going on the piano. If you are a more experienced piano player, you may skip over the Piano Start and use the navigation system to go right to their Lessons area where you can select from over 300 different archived lessons. Another alternative to combing through the lesson topics is to allow the system to create a Lesson Plan for you based on your current knowledge and interests. My Dashboard, showing the Piano Start section. PianoWithWillie has a 22-point assessment which not only checks your music theory knowledge, but also queries your practice habits, musical style interests, and what your current lesson goals might be. After you complete the assessment, the program creates a Lesson Plan customized for your goals and current abilities. You can create more than one Lesson Plan too if you have more than one goal for your lessons! Each Lesson Plan will remain available even if you create another and you can work on multiple lesson plans at one time since it is not required that you complete a plan before going to any other lessons. This is really one of the great attributes of this program. While the plans make recommendations for your skill level and interests, you are free to study lessons that interest you in any order. The Lesson Plans are shown on your Dashboard and will contain a mixture of suggested topical articles to read and video lessons. The lessons can be quite lengthy in duration, which is why it is so convenient that each lesson is broken into chapters. For example, the first lesson in one of my plans was 51 minutes. However, that lesson was additionally broken into 10 chapters to make it easier to complete. The program keeps track of how much you've completed from each individual lesson as well as which portions of each Lesson Plan have been finished. Piano Plans - Easy access to all created plans at any time. Every video lesson is viewed in a similar format with the screen being divided into sections. There is always a smaller section where you can see the instructor speaking, along with a larger section that shows a closeup of the keyboard. Notes, chords, and other information is superimposed on the the keyboard when needed too. From my experience, each lesson also appears to have some printable portion to it. Whether it is sheet music for the particular song used or even just a practice planning sheet, every lesson provides much more than the video. A huge selling point for me was that, unlike private piano lessons that have a scheduled time, PianoWithWillie can be used at any time of day or night and the music student can progress at their own speed. The lessons can be watched on a computer, or on a tablet device, such as an iPad. If you have a piano instead of an easily portable keyboard, the most effective way to use the lessons is with a laptop or tablet near the piano. Personally, I used an iPad at my piano. First I needed to decide on what my goals would be with these online lessons. Despite the years of private piano lessons I have taken, I never became proficient with anything that has a rock beat to it. My area of interest was always Classical music and I just didn't even try to play popular music until recently. I also have the added complication of a damaged left arm. Over 11 years ago I shattered my left elbow and broke both arm bones up near the elbow. While this was all repaired, of course the arm does not work exactly as it should anymore and my piano playing was affected. I've tried since that injury to adapt my playing, but could really use some technique reminders to help in that adaptation. I took the PianoWithWillie 22-point assessment initially with the thought in mind to brush up on my Classical playing and restructuring my practice times. The results came up with one lesson in my Lesson Plan along with several articles to read. While all the information in the articles and video lesson was already known to me, much of it I had begun to neglect or at least had forgotten why I was doing it. The lesson was a great reminder and guide to get my practice times going in the right direction again. Since the practice time lesson had been such a success, I decided to step out of my comfort zone of Classical music and retook the 22-point assessment with my interest selected as "Rock and Pop Piano". This yielded me another Lesson Plan set with more articles and four advanced video lessons. The lessons focused on rock groves and soloing techniques along with improvisation demonstrated through learning a specific rock song. I took my new knowledge from these lessons and selected a rock/pop song lesson from the general lesson archive - Every Breath You Take. It took some practice, but I began to feel more confident with this style of playing. In my piano music resources at home, I have books and binders of pop music attempts that I gave up on because it just didn't feel right or comfortable. Pulling out a few of those songs, I began to plunk my way through them again and see if my lessons had any effect. I'm not sure if my playing of those pop songs sounds any different to the casual listener, but I feel more in control and actually enjoyed playing pop music after my PianoWithWillie lessons. While one of my original goals had been to perfect or at least improve the technique of my damaged left arm, I had been almost afraid to select that option during an assessment. Finally, after such positive experiences with the rest of the program I went ahead and completed the assessment one last time, selecting "improving my coordination and technique" as my current lesson interest. I was again given a new Lesson Plan with articles and advanced level lessons on pain & technique, fast fingers, warmups, and scales. This is probably where I should have started. My practice times. If you look closely, you can see the left arm at a strange angle. It doesn't rotate properly, which affects my technique. Obviously, these online lessons were not designed to deal with my specific physical limitations, however by watching their lessons on technique, specifically the one addressing pain while playing, I was able to correct some habits that had been hindering my use of the left arm and hand. I have been nothing but pleased with PianoWithWillie. My piano technique improved and I was finally able to include a new style of music to my repertoire. Not only will beginner or moderate level musicians benefit from this program, but I can vouch that advanced level players who may not have time or access to private lessons will also find their skills improved by using PianoWithWillie. Please check out what other members of the Review Crew thought of the various JazzEdge products.